As language admin you have an extra item “Translation” in left top menu! You can open this menu or just click on translation! At your language page you see three little notebooks; if you click on those, you get to the translation section of your choice. If the notebook is a in a red cel, this means there are new items to be translated and translation of your lanuguage is not at 100%. An important part of the work of an LA is the translation of News items. The most recent news is shown on the Welcome screen of the webpage. Newsitems are very rarely released, but when they appear, they contain important information about the latest changes and developments in Hattrick Youthclub. To keep the users in your languages informed and up to date, please translate these items! If you click on the left notebook, a small yellow box will appear. Again you click on the notebook. Then a text field appears in which you can save your translation. To see the text that needs to be translated, you click in the middle of the screen at “languages” and choose the language that you want to translate from. 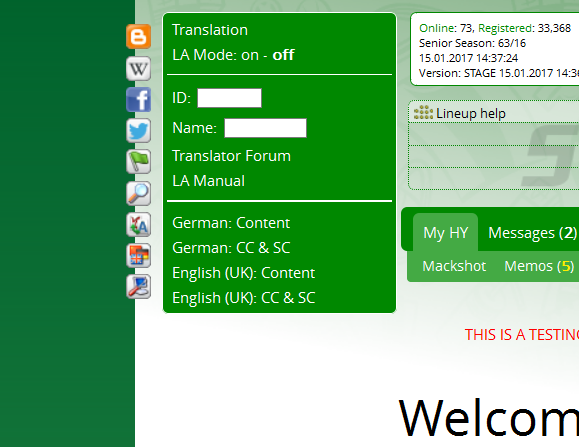 If you save your translation, the result of your work can immediately be seen, in the welcome screen of Hattrick Youthclub. 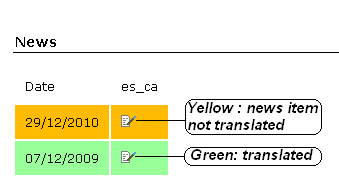 The translation boxes of your language are grey. When you click the box, it becomes white and it is ready to (over)write the translation. When you are done, and the translation is OK, you click somewhere outside of the box and the color turns grey again. Your translation is done! Of course you can always edit the translations. You overwrite the translation if you think it is wrong. There is no need to fear to make mistakes; every human being makes mistakes and things that are wrong can be overwritten again and again. If you see a term on the website that needs to be changed, click in the LA mode at on. Nothing seems to happen, but when you click a second time somewhere on the page, suddenly all translation ID's of all terms appear! 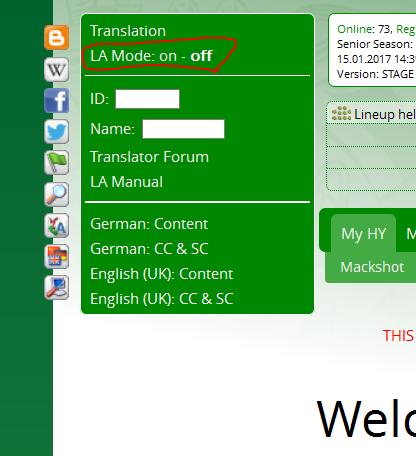 When you have found the ID of the term you want to change, you can open the translation menu and fill it out in the little white ID box of the LA-mode. When you click on enter you will immediately be redirected to this term on the translation page! SHOW UNTRANSLATED: Shows the terms that still need to be translated. SEARCH: If you want to correct a translation, you can fill out the term in the box. This way you can easily find the term and change it. —> New LA Mode! Where does that appear? : For some terms will be listed where how often these terms appear on the website. Changes: Shows who has translated the phrase or changed the translation. Do not translate scout and trainer comments but search for the counterpart in the new language in Hattrick. In Hattrick you can easily change the language by clicking on the left top of the page on the word “Hattrick”. On the right side of the page appears the list of all available languages. In translation of the coach and scout comments, it is important that the text you insert at Hattrick Youthclub, is excactly the same as in Hattrick! For instance: if you forget the dot at the end of a comment, importing the comment will be impossible for all users in your language. If there is a problem with importing a comment, then check if all chars are present and if the user copied the whole comment, including the dot at the end of the sentence. As LA you have a mailbox that you can use to communicate with users of your language. This mailbox is also used when new terms need to be translated. 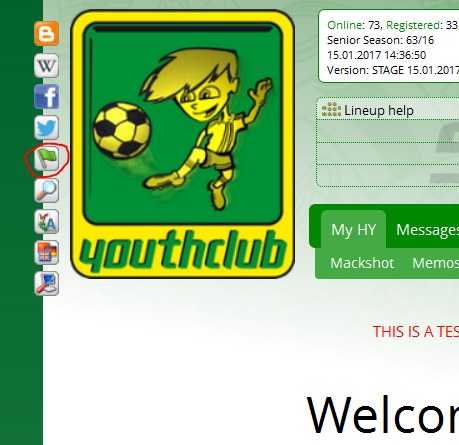 So if you open up Hattrick Youthclub, please always check if you received mail. Not only because you are responsible for translation of your language, but also because you are a contact person that people in your language can turn to when they need help. You can help the users and developers quickly if you fill out your e-mail address in settings. 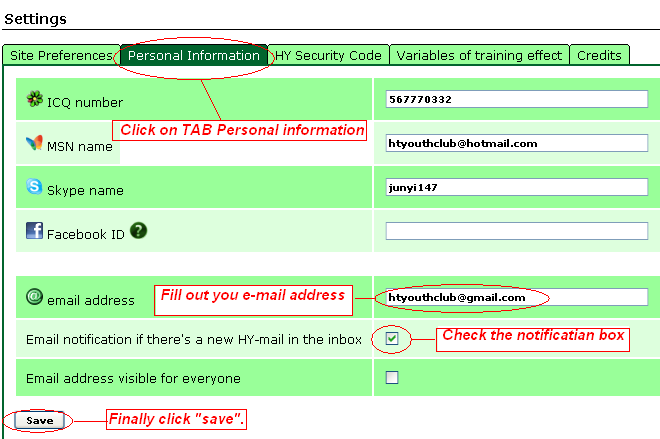 Then you will receive an e-mail warning when you have received mail on Hattrick Youthclub. The number of active Hattrick Youthclub users has increased and so has the pressure on the developers. Every week many mails and bug reports of users are received. In many cases these mails and bug reports are written in a language that the developers do not understand and in many cases bug reports are written by people who do not understand how Hattrick Youthclub works. To reduce the workload for the developers, every LA can make a contribution to help users and developers. So please check your mailbox, and check if there are any bug reports in your language. Many hands make light work! If LA's can't solve a problem themselves, they contact the developers. You share the language inbox together with the other translator(s) of your language, so if you mark a mail as read, it is marked as read for everyone! If you are willing to translate the manual in your language, feel free to do so! Many people in your language would be happy. You find the manual by clicking on “Help” and then on “Manual”, on top of the page. If you want to create or edit the manual in your language, you have to click on the flag of your country. Here they Wiki syntax is described. It shows the things that are possible on the Wiki pages. Here you can play around and practice how to work with the Wiki (syntax). 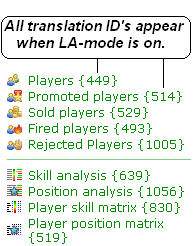 LA's have access to the Translation-forum. Only LA's are reading and writing here. If you have any questions about translations, ask for help here. Other LA's can answer your questions and developers publish important information here too. Important notes for the translation: If you have no idea how you could translate a term you could use a dictionary or contact the other translator in your language. Another thing that can be helpful is Google translations.